The 2019 GEICO U.S. Figure Skating Championships are taking place through Jan. 27 at the Little Caesars Arena in Detroit, where the temperature was 3 F Sunday night. But NBC Sports’ experience with figure skating in another, equally frigid venue is helping make the broadcast of this year’s U.S. national figure-skating championships sound as sharp as the skate blades themselves. A notch to accommodate the mic casing is melted into the ice, along with a narrow trench for the cable. Malone says mics embedded in a sports rink’s ice can be as sonically effective as, for instance, the microphones increasingly used around home plate for MLB games, putting a sound-capture device as close as possible to where an athlete’s prowess meets the object of the game. In this case, NBC Sports deployed the Audio-Technica AT880s piezo-electric microphones, the same ones it used in South Korea at the Olympics. In Detroit, however, besides securing the U.S. Figure Skating Association’s assent for the microphone project, the venue itself had to accommodate not only the figure-skating event but the NBA’s Detroit Pistons home games on Jan. 18 and 19, which overlapped the start of the figure-skating event. The arena would have to build the figure-skating ice on top of hockey ice, cover it for two days of basketball, and then uncover and load it in for figure skating. Malone says the USFSA was very accommodating, once folks there saw NBC Sports’ detailed process. Six of the waterproof AT880 PZM mics were installed. The venue’s ice technicians used a heated metal block to melt a notch in the ice the same size as the mic casing and positioned the mic in it, with a narrow trench for the cable, which was laid 12-15 ft. from the dasher, or side barrier. 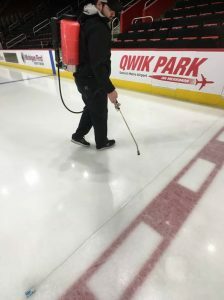 They sprayed the assembly with water, which froze solid about a quarter inch into the hockey ice, which was already in place. The microphones were powered by 48 V phantom power from the console, to prevent the significant decrease in battery performance that occurs at temperatures below 32 F.
After installation of the six microphones, the venue staff painted over the complete field of play to cover the existing hockey faceoff spots, circles, and lines and installed the appropriate figure-skating and sponsorship logos. They then laid down 1.5 in. of ice for the figure-skating competition. At that point, the microphones were 1.75 in. below the top of the ice. 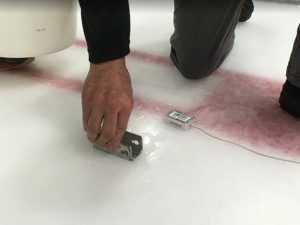 After being buried in the ice, the mic is sprayed with water and freezes into the hockey ice, over which the figure-skating ice will be laid. The rink was covered, and a basketball floor was laid on top for the two Detroit Pistons home games and subsequently removed for the figure-skating event. The embedded microphones add a crucial aural component to the viewing experience: putting viewers not only in the stands but also, to an extent, inside the heads of the judges. Viewers at home will hear what the judges are listening for. But experience suggests that those ice mics will substantially enhance the experience of both those watching and those doing the mixing.